So with the snow and cold weather comes sitting by the fire, enjoying a glass of wine, and cozy evenings. What could be better than that? How about adding some friends to the mix and, of course, a charcuterie board! According to www.charcuteriestyle.com, term charcuterie comes "from the French words for 'flesh' (chair) and 'cooked' (cuit)... [and] was used to designate shops in shops in fifteenth-century France that sold products made from pork...". These French shops were not allowed to sell uncooked meat so they developed different methods to preserve dishes to increase shelf life and saleability. Not that the French were the first to develop preserving techniques themselves, and of course the technique of preserving food can be undoubtedly declared as one of the most important developments in humanity's advancements in food preparation overall. As humans are apt to do, basic need for food to last longer was only the beginning. Smoking and salting techniques for sausages, bacon, ham, and even chicken and eggs and more - as well as dehydrating and canning and more! - not only made food last longer, but taste so delicious. Charcuterie has certainly earned its place over a long history, through fundamental methods and rich traditions of preserving foods and curing meats. This special type of food preparation and presentation has produced some of the most flavourful creations while being simple and timeless. 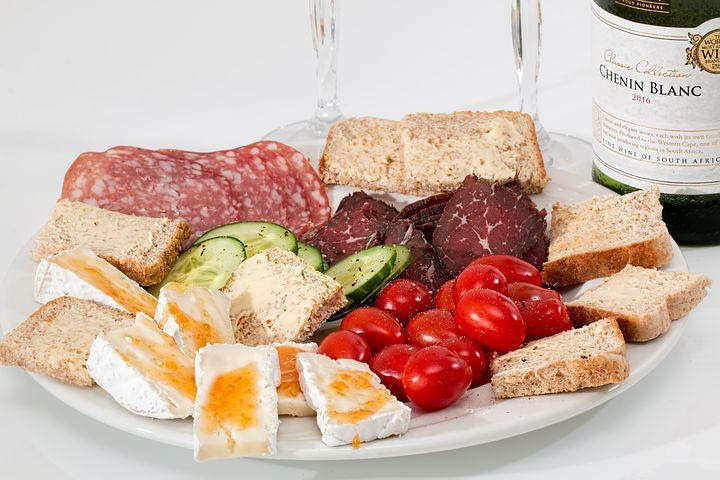 When preparing charcuterie, even the most basic of meals can be elevated easily with oils and vinegars, as well as some high quality condiments. Enhance your meats, cheeses, breads, nuts, seeds and more, with a drizzle of rich, fragrant olive oil and decadently thick 18-year-style balsamic. Try a gourmet mustard with ham. Drizzle a flavoured honey over cheese and bread. Sprinkle some perfectly seasoned pumpkin seeds over top. In our area of Manitoba, many of us with Mennonite roots are familiar with "faspa" which means something like "little meal". Maybe the Mennonites were onto something wonderful with their buns, pickles, jam and cheese. And there's not a lot one can (or should) do to improve on Grandma's homemade bun recipe. C'mon, we're not going to tell her how delicious a warm crusty bun is when sopping up a dipping plate of Tuscan Herbs Olive Oil and Cranberry Pear White Balsamic, or how satisfying it is use a dollop of Hot Honey Jalapeno SMAK DAB mustard instead of the yellow bottle that's been in her fridge for 10 years. Not to mention our antipasto, dill & almond pesto, bacon jam - all of which you could practically eat with a spoon. Mennonite or French, doesn't matter. You likely have some basic groceries in your home right now to pull off a modest charcuterie platter. It doesn't have to be hard. But it should be delicious. Come see us for the perfect accompaniments for your holiday charcuterie boards. And check out these recipes that would be perfect for a charcuterie board!